Spurred on by my success I was eager to see if my new-found eel catching skills would work again. The sun had been shining all afternoon and despite a twinge in my dodgy hip that had made me utter a sharp expletive I put the gear in the car and hit the road for the short drive to the canal passing haymakers cashing in on the dry day with rain forecast for the morning. It had clouded over when I arrived but wasn't threatening rain. The float rod was cast out to the accompaniment of the opening bars of the Archers theme tune. It proved tricky to get bites this time. A couple of tiny perch were returned, one eel bait roach put in the bait bag and a better roach slipped back. By eight thirty I'd had enough and the eel rods went out. This time I fished one to the far bank on the long lead link and the other in the central channel where I'd had a run last time out following a cast that dropped short and was left. Again I fished the lightweight bobbins on a drop and the baitrunners set as slack as they go. It was still well light when the bait in the channel was picked up. A few twitches of the bobbin preceded a full blown run. 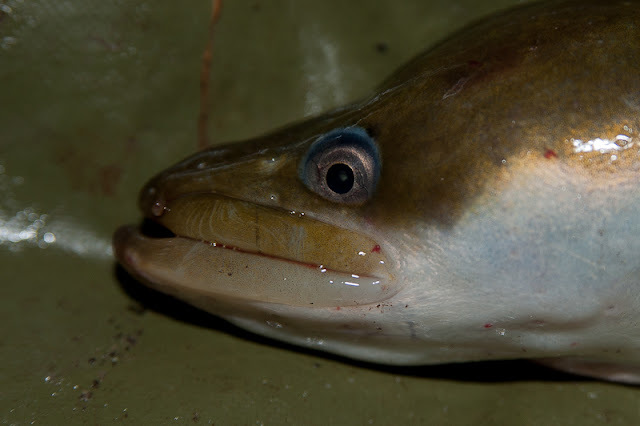 The eel was the smallest so far at an estimated pound. Given my limited ambition I classed that as a result. As has so often been the case one run signalled another, which I missed. This was not to be the start of a hectic feeding spell. After rebaiting the second rod I felt another sharp twinge in my hip. I settled back into my uncomfy chair and watched the world slow down. The haymakers were still at it. The sound of their diesel powered horse replacements drifting on the dying wind. I'd been serenaded by a male reed bunting on a high hawthorn branch earlier. A tediously repetitive song that I suppose other reed buntings appreciate. The swallows were flying a little higher than last time, but when dusk came they were speeding past me a foot or two over the canal. I thought they were having a final hunting session as they swooped in towards a stand of reed and out again. As I watched as closely as I could in the gathering gloom I realised they were seeking out a roosting place. One by one they swerved in towards the reeds and quietly disappeared. The eels must have been roosting too. They came out to feed after dark. I say dark but there was a sort of moonglow even though the moon itself was hidden by cloud and not half full. Not enough light to bait up by, but enough to manage most tasks without a light. The next run again came to the channel bait, and yet again it was a churner preceded by a few twitches. This one was larger than the first fish, but still not big enough to warrant setting up the tripod. As I returned it the left hand rod was away in similar fashion, resulting in a the bait being pinched before I could strike. It does seem (at the moment) that giving the eels some slack line makes them take the bait confidently enough to carry on once they feel the (light) tension of the baitrunner. I'm also pretty sure that not trying to strike immediately helps. This is possible on this length as I'm not fishing where there are deep beds of sparse reeds for the eels to run in to. By now the hip was aching constantly. While sorting the gear out I had another twinge and thought I ought to get off home while I could still walk. The far bait was picked up and dropped while tidying the gear. When I wound it in it had clearly been clamped on. I struggled to swing my bag over my shoulder, and bending down to pick up the chair and rod quiver was laborious. Even so I managed to get back to the car without a pause for rest. It did take me quite a while though. 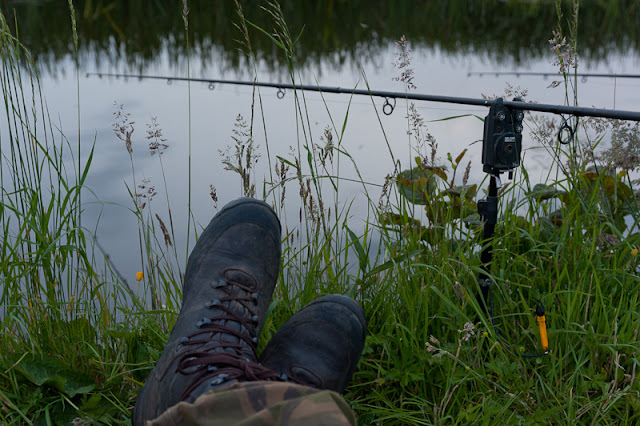 Why do I always have to fish as far away from the car park as possible? Driving home they were still making hay while the tractor lights shone.